Conversation with Smaug by JRR Tolkien. In this interesting feature over on Heirs of Durin, Ringer ArchedCory delves into the nature and characteristics of Smaug as described in The Hobbit — and the alterations to these traits that J.R.R. Tolkien made during the writing process. So that’s it, not a very exciting story. 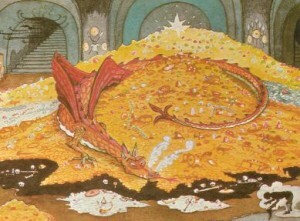 However, what most people might not know: Smaug has not always been called Smaug! In the very first manuscript (of which merely six hand-written pages exist), back in a time when the wizard was called Bladorthin, the chief dwarf Gandalf, and his grandfather Fimbulfambi, Smaug also had a different name, and it was Pryftan. Apparently “pryf” is the Welsh word for “vermin” and “tan” means “fire”, so that name – as most of his others – was possibly also very well considered. However Pryftan didn’t survive very long. Already in the second manuscript, written down only shortly after the first, Tolkien struck out Pryftan and wrote Smaug instead. Why he changed the name, we will never know. From the very beginning up until the published book, the text read that dragons live “practically for ever, unless they are killed.” When Tolkien in 1960 attempted to re-write The Hobbit in a more mature way to better fit the tone of the Lord of the Rings (he never made it past Rivendell), this line was changed to “five thousand years maybe”, and soon to “a thousand years maybe”. I suppose Tolkien was always aware they are mortal, just within a much longer time range than men, or even dwarves. Since he was writing a children’s book at first it was convenient to write “practically forever,” as 1000 years are already hard to grasp for a human, especially a child. It is interesting he lowered the number from 5000 years, which probably sounded too exaggerated, even for a dragon.